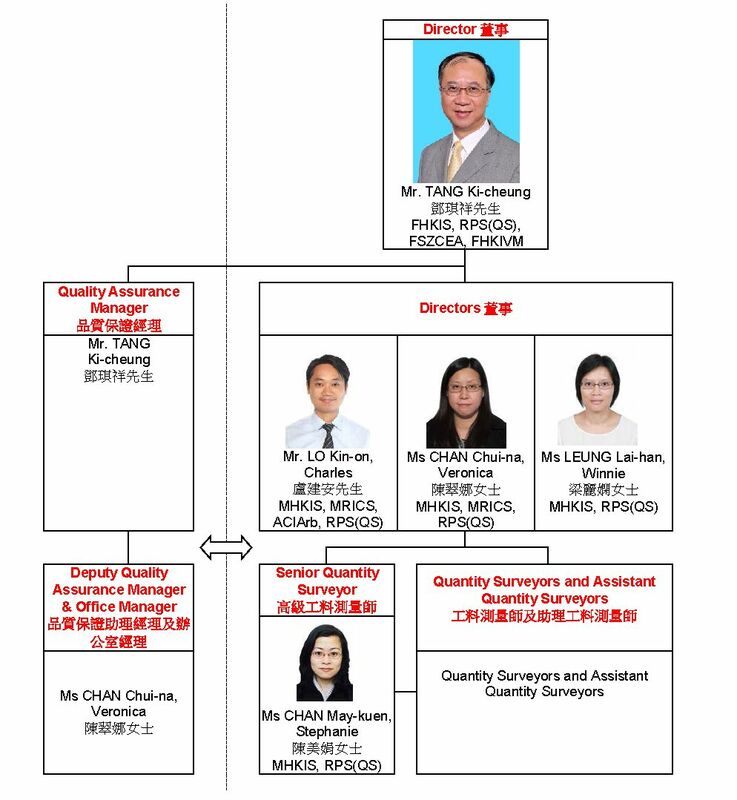 We have a very simple organisation structure with short communication channel between the Director and the staff. April 2017: Attending a talk on: "Applying Value Management & Building Partnership in Workplaces, Families and Marriage Systems"
August 2007: Hong Kong Institute of Surveyors: CPD event: "A Walkthrough from Tender Invitation to Binding of the Contract"
December 2011: Hong Kong Institute of Surveyors: CPD event: "Tendering"
March 2012: 6 Joint Professional Institutions: One day Seminar on Contract Management 2012: "50 Nota Benes in Tender and Contract Documentation"
August 2012: Hong Kong Institute of Surveyors: PQSL series: ”Basic knowledge of Measurement, and Pre- and Post Contract Documentation"
January, 2015: QS Division, Royal Institution of Surveyors Malaysia: BIM Seminar Kuala Lumpur 2015 - 5D BIM for the Construction Industry: "Minimalist Modelling and Coding of Revit for Quantities"
June 2015: Pacific Association of Quantity Surveyors: 19th Annual Congress in Yokohama, Japan: "Special Features in the Standard Form of Contract for Maintenance and Renovation Works for use in Hong Kong, First Edition 2013"
November 2015: Hong Kong Institute of Surveyors Quantity Surveying Division and Australian Institute of Quantity Surveyors: Joint Conference: "Introduction to the Standard Form of Contract for Maintenance and Renovation Works for use in Hong Kong, First Editiion 2013"
November 2015: Hong Kong Institute of Surveyors Quantity Surveying Division Visit to Foshan: Seminar: "The Theory and Practice of Full Quantity Surveying Services"
April 2016: Hong Kong Institute of Surveyors: QSD BIM Series 2016: "Minimalist Modelling and Coding of Revit for Quantities (an Update 2016)"
June 2016: Department of Housing and Rural-Urban Development of Hubei Province: Experience Sharing Seminar on Urbanization of Hong Kong: "Characteristics of Construction Cost and Contract Management of Hong Kong"
November 2016: Hong Kong Institute of Surveyors: PQSL series: "Introduction to the Standard Form of Contract for Maintenance and Renovation Works for use in Hong Kong, First Edition 2013"
May 2018: Hong Kong Institute of Surveyors: YSG/BSD CPD event: "Procurement of Repair and Maintenance Works"
Fire Safety Improvement Works to Alexandra House for The HongKong Land (Property Management) Ltd. The following are terms laid down in the employment contracts of our staff. "You" means the staff member. "the Company" and "us" mean our company. Your unauthorized disclosure of confidential information held by the Company to other parties shall be regarded as a serious misconduct. You shall comply with such rules and disciplines as may be enforced by us and applicable to all staff employed by us. It is our objective to provide quality service to our clients with profits. You shall not act to conflict the interests of the Company or any of our clients. You shall maintain a high degree of professional conduct and ethnics as demanded by law or by the rules of conduct enforced by the professional institutions that you belong to. the performance of your duties is not affected.